Written by Rachel Wagstaff to mark the 100-year anniversary of the end of the first world war when at least 10 million people (many underage) lost their lives. The popular 400-page Sebastian Faulks novel that covers three different time periods, has been turned into a play of just over two hours. Even though some of the story has been omitted and it remains sympathetic to the spirit of the novel, I must confess that at times it felt almost as long as the war itself. The brutal reality of the trenches and tunnels and the needless horror of the bloody battlefields of France are well depicted and combined with scenes from an earlier peacetime and a love story at the heart of this tale. It is an emotional and gripping production that begins in 1916, before the Battle of the Somme. The hopelessness, waste and insanity is captured onstage, and the audience are immersed in the horror and devastation of warfare and its inescapable misery and terror by a creative evocation of the sombre and explosive soundscape, graphic lighting displays and what must have been a flesh rotting and gas ridden stench. Several sudden loud explosions rocked the theatre and had the audience jumping out of their seats. The battle scenes are interwoven with regular flashbacks to the love affair of Stephen and Isabelle and the deeply contrasting moments of normality. As the war drags on, we see the changes in the soldiers as they become wearier in body, mind and spirit, more desperate and withdrawn, shocked and traumatised by the deaths around them with only their memories to sustain them. The set is realistically designed to create the feeling of being stuck deep in a muddy trench and of crawling through the maze of tunnels. The skyline is bleak and dominated by broken wooden fencing that looks like a cross on the horizon. There are regular scene and time switches taking us to the intimate interiors where the lovers meet, a riverside picnic and a hospital bedside. These regular backdrop switches, a little too sudden and confusing at times, transport the audience through time and the many different layers of the story, from when life was peaceful and normal to the horror of life in the trenches, and along the way tells several individual tales of love, hate and conflict. The tension and horror of the first half of the performance leads towards the ill-fated Battle of the Somme, when the men go over the top of the trenches to face the onslaught of bullets on the battlefield, from which most do not return. Leading up to it and throughout the performance, individual soldiers read extracts from some of the letters sent to and from the soldiers which provide some of the most realistic and poignant moments of the drama. In these readings, we get to witness the personal battles, fears and concerns for loved ones who they will probably never see again. An interval has never been so welcome and I saw people shell-shocked in the foyer. It must be hard to add cheer, music and romance to such a tale of devastation, but Birdsong was interspersed with moments of jollity and camaraderie thanks to Wagstaff’s adaptation. The cast all put in such excellent and hard-working performances that by the end of such a long and mostly serious production, they all looked in need of a sit-down. They made the emotional and physical pain so real it was sometimes uncomfortable to watch. During the periodic lulls in the fighting and sounds of war, we hear the uplifting birdsong of the title that contrasts so vividly with the sights, sounds and smells of the brutality of war, and the sweet sounds appear to represent hope amid the corpses of No Man’s Land. Due to some skillfully positioned violin pieces and bouts of singing we are transported from the smothering sludge and gas of the trenches, but only momentarily. The melodic sounds and moments remind us that among the mindless killing and the worst that human beings can do to one another, there is a yearning for the things that bring them joy. 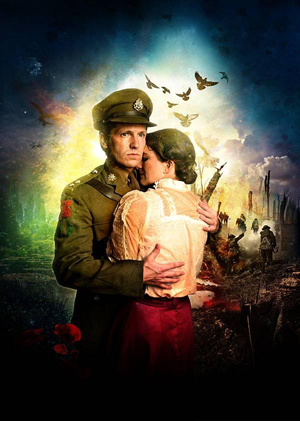 This play is poignant and heart-wrenching, and paints a vivid picture of war, love, grief, friendship and bravery. There are so many moving and realistically portrayed scenes that you leave the theatre feeling as if you have been in a real emotional and physical battle, and will probably suffer from post-traumatic stress as soon as you step outside. But above all, it is the camaraderie, bravery and compassion shown by so many despite conditions of utter depravity that remind us of the incredible endurance of humanity, and what makes us human in the face of such carnage. It forces one to question whether it is sweet and fitting to die for one’s country, or just an old lie as so vividly questioned in the war poem of Wilfred Owen, which I couldn’t help thinking about while safely seated in the comfort of the Lowry Theatre - far away from the many physical and verbal wars raging all over the world right now. Never again, it was said after such a war and the enormous waste of life. If only that was true. See https://www.thelowry.com/events/birdsong for tickets.